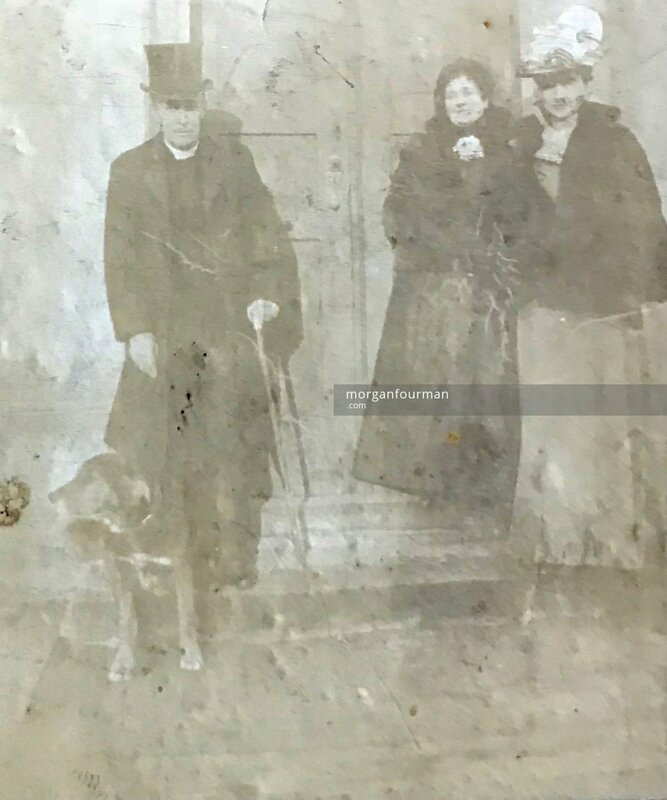 The Rev Robert Brooks Egan was born on 17 Feb 1855 in co Clare, Ireland, He married Nelly Marten on 30 Apr 1889 in Codsall Parish Church. According to Crockfords (1898 edition) he obtained a BA from the University of London in 1880 and was ordained in Rochester in 1882. He held a number of domestic clerical posts notably at St Michaels, Paddington. 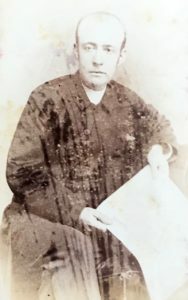 Significantly he served as a Chaplain in the Royal Navy from 1883 to 1887, taking him both to China and the West Indies. When he married Nelly he was Canon in Buxton before moving to Mansfield. He was appointed as British Chaplain in Gotha in Germany in 1898. We have two interesting artifacts that come from him. As both Robert Brooks Egan and and Nelly Egan died childless in their forties, we can assume they went to and were kept by Nelly’s sister Floss and hence remain in our family archives. Gotha was the winter palace of the Dukes of Saxe-Coburg-Gotha. In 1893 Alfred (Affie), Duke of Edinburgh succeeded to the title held by his paternal grandfather, Prince Albert. Affie took the title ahead of his elder brother Bertie, later to be Edward VII. This meant that an English speaking Duke was placed (essentially at Victoria’s instruction) in the middle of the German aristocracy. 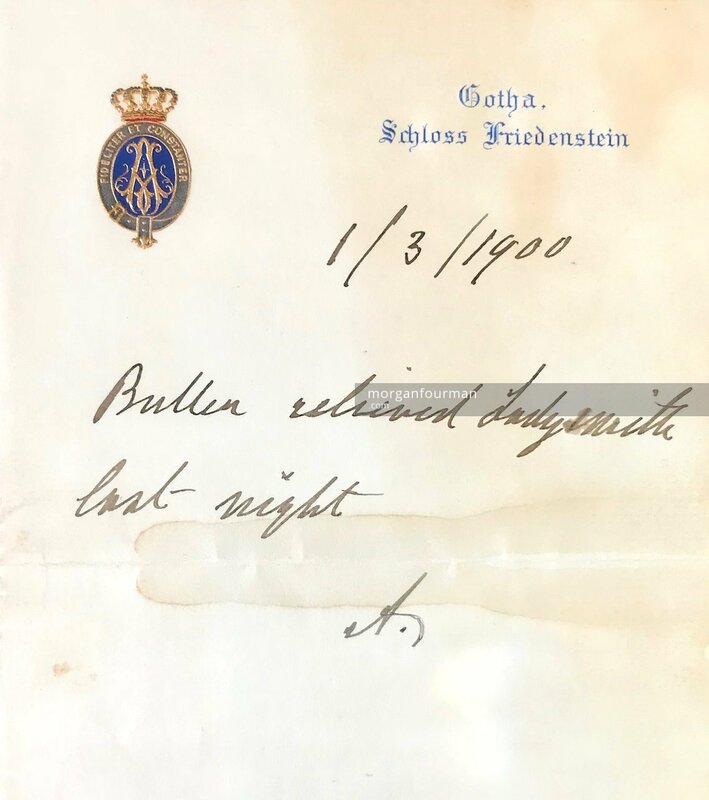 The chaplaincy was a key post in the small British community in Gotha and clearly brought Rev Robert Brooks Egan in close contact with the royal family. There are two items in the family archive related to this period of his life. 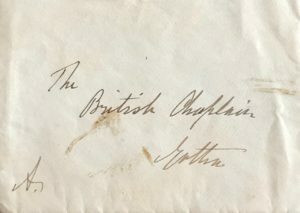 The first one is a Royal crested letter and an envelope signed “A” to the “British Chaplain” dated 1 Mar 1900. 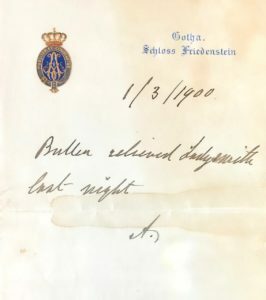 The one line message reads “Buller relieved Ladysmith last night”. 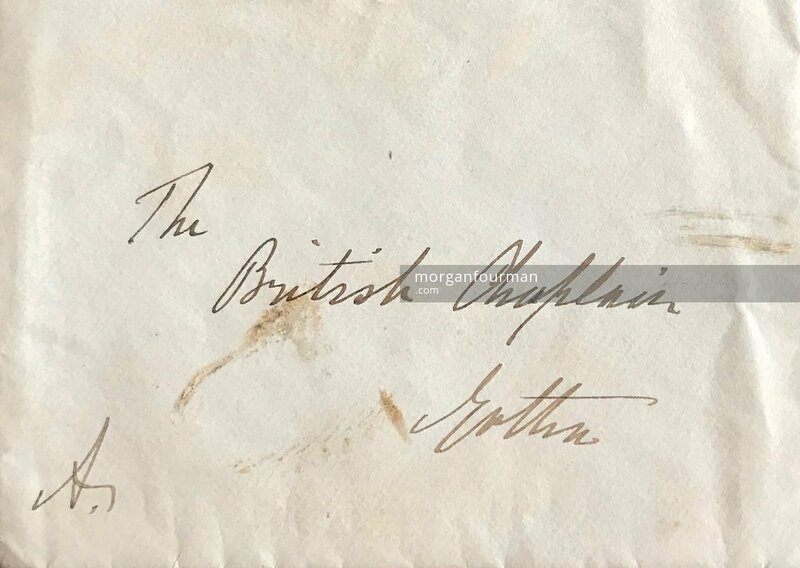 The monogram would appear to be the signature of the Duke. It refers to the Siege of Ladysmith (the Second Boer War) and its relief by General Redvers Buller on 28 Feb 1900. 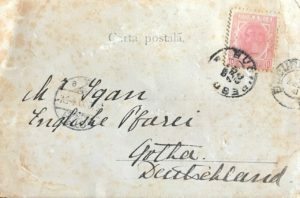 The second is a Christmas postcard received on 25 Dec 1900 from Bucharest signed by Marie, the Crown Princess of Romania at the time. 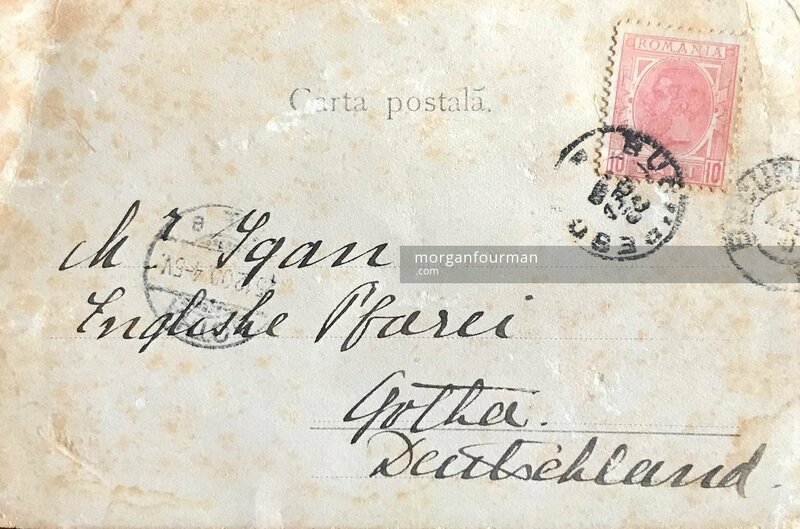 This is from Affie’s daughter and is addressed on the front to “Mr Egan, Englishe Pfarei, Gotha, Deutschland” (sic – two German spelling mistakes). The card states that the family is in mourning for her father, Affie, who died in July 1900. Robert Brooks Egan and his wife must have returned to England shortly after this and were both themselves dead within six years. 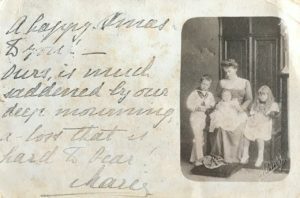 On 6 Jun 1889 Rev Robert Brooks Egan officiated at the wedding of his sister-in-law Florence Eliza Marten with Henry Evans. This ceremony took place in the same church where he himself was married a few months earlier.